Jeremy Mack could sense a “stirring” in his life. He felt the hand of God shifting things around him at Grand Canyon University. He asked the Lord for guidance. The prayers led to a new job opportunity far different from the multiple enrollment-related roles Mack filled at GCU for five years. He prepared himself to work more intimately with campus students. 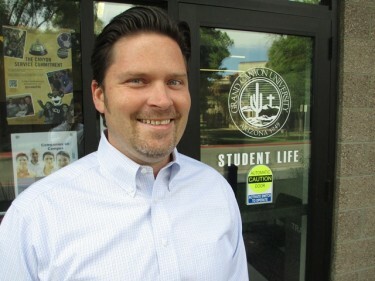 Jeremy Mack is GCU's new director of student engagement in the new Office of Student Affairs. Mack, 36, was appointed director of student engagement as part of an Office of Student Life reorganization announced this month. By fall, the campus Student Life office at Prescott Hall will be renamed as Office of Student Affairs. The new office will be comprised of Mack’s Office of Student Engagement, in addition to the offices of Residential Life, Spiritual Life and Career Services. Each will remain located at Prescott Hall. Mack said the student-engagement office will oversee the Associated Students of GCU student government, more than 40 student-led clubs, intramural sports and efforts to connect with commuter students. Mack, the father of four children, is a third-generation Christian minister and already is busy preparing for the fall. He described working with young people as “his heart,” or where he feels God placed him to make an impact. Enthusiastic students already are popping by his office, tucked in a back room at Prescott Hall, to share their thoughts on how to better engage students on campus. “Whatever (I’m) working on is going to wait,” Mack said about the unscheduled visits, which he encourages despite the typically frantic Student Life schedule. Mack said the idea is to empower students to grow their own ideas about how to bring clubs, events and culture to the ever-growing campus. Intramural sports such as flag football and basketball draw hundreds of students. As part of the reorganization under the new Office of Student Affairs, John-Paul Reiger will oversee all campus resident directors and their residence assistants, in addition to disciplinary review processes, as the soon-to-be director of residence life. His leadership is expected to fill at least a temporary void by the departure of Housing Operations Manager Eric Andrews, who leaves GCU this week to prepare for a new job as a police officer for the Avondale Police Department. Meanwhile, Student Engagement Manager Sarah Thatcher, Intramural and Recreation Coordinator Matt Lamb and Student Activities Coordinator Anthony Mann will report to Mack. Dean of Students Pastor Tim Griffin said he prefers to hire from within whenever possible, especially since GCU is such a fast-growing environment where staff work so closely with student leaders. The separation of Student Engagement from other facets of the Office Formerly Known as Student Life was essential to cultivating some of GCU’s best and brightest personnel, Griffin said. “We wanted to create new lanes for people to develop their careers in,” Griffin said, adding that Mack’s personality and heart for students fits the new Student Engagement role perfectly. The Student Engagement staff members are a bit like coaches in the athletic department, only that they cultivate Christian student leaders rather than student-athletes, Griffin added. And, like the Antelopes’ shift to NCAA Division I, many things are changing on campus. Expect to hear Mack blowing the whistle and shouting encouraging words as his team takes the field come fall.